Adequate space: Are you satisfied with the amount of counter space, cabinet space and floor space in your kitchen? The position of your refrigerator or shape of your counter may be taking away useful workspace. According to the NKBA Kitchen and Bath Planning Guidelines, when replacing a countertop or changing the shape of your kitchen, keep in mind that a total of 158" of countertop frontage, 24" deep with at least 15" of clearance above, is needed to accommodate all uses, including landing area, preparation/work area and storage. Traffic flow: If there's more than one cook in your household, you may want to consider making more room around the main workspace. If you enjoy entertaining, you may want an open plan kitchen that allows for more social interaction between the kitchen and other rooms. According to the NKBA Kitchen Planning Guidelines, the width of a walkway should be at least 36" and the width of a work aisle should be at least 42" for one cook and at least 48" for multiple cooks. Children: Depending on whether or not you have children, and their ages, your kitchen may need to be remodeled. Dated appliances and the design of your kitchen can be hazardous for young kids. If you are in the process of extending your family, you may want more room for cooking larger meals and lower cabinets for easier access to children's food. Based on the NKBA Kitchen Planning Guidelines, microwave ovens should be installed 3" below the principal user's shoulder but no more than 54" above the floor to avoid accidents. The NKBA also suggests avoiding sharp corners on countertops with kids around. Universal Design: Is your kitchen accessible to individuals with disabilities? Will you be able to use your kitchen safely as you get older? Considering these issues is vital in a kitchen remodel. Employing Universal Design techniques in the remodel will help assure that the space is as accessible to or useable by all people, regardless of age, size or physical ability without the need for adaptation or specialized design later on. Location: Thinking about adding a deck to the side or back of your house? Incorporating a door into the layout of your kitchen would be a great convenience for outdoor entertaining. You also may want to rearrange the position of windows to allow more or less sunlight or to watch your children play in the yard. When rearranging the layout of your kitchen, according to the NKBA guidelines, the clear opening of a doorway should be at least 32" wide, which would require a minimum of 2'10" door. Keep in mind that a cooking surface should never be located under an operable window. Kitchen and bath remodeling requires a contractor that is sensitive to the needs of the homeowner. Loridan Construction has the experience in kitchen and bath remodeling to keep your household running smoothly throughout the demolition and reconstruction phases of updating your home. When it comes to kitchens, what's your style? Take this quiz to find out! Here's a comprehensive resource if you're contemplating remodeling your bathroom. Read up on bathroom vanities, bathroom fixtures, bathroom designs and more! The kitchen is becoming more than just a food preparation area in today's society. Yet, on average, the kitchen still remains one of the smaller rooms in the house. The National Kitchen and Bath Association (NKBA) considers any kitchen 150 square feet or smaller to be a small kitchen, but that doesn't mean you can't make it look more spacious with some big ideas. Use unique storage solutions. Install high pantry cabinets to eliminate extra small cabinets. Add pullout shelves, rotating inserts and tilt-out bins to increase accessibility and storage within the cabinets. Light colored cabinets, open shelves, wire organizers and glass-front doors will help to lighten the space. Also, by adding more open display shelves/cabinets, the room will look greatly expanded. Too many cabinets, especially made of dark materials, will give the illusion that the room is much smaller. Choose appliances wisely. There are numerous high efficiency, sleek appliances that will allow individuals with small kitchens to have the same luxuries as those with large kitchens. Try to keep your cooktop and oven in the same area. This saves valuable counter space. Have microwaves built into the cabinetry to increase counter space. Keep all small appliances stored in either an appliance garage or pantry to maintain a clutter-free workspace. Maintain a mix of natural and ambient lighting. A skylight will open the ceiling to more light and raise a portion of the ceiling, visually expanding the space. Bay or greenhouse windows create an open feel. Natural light should be complemented by ambient and task lighting to provide the same feeling during the night. Add personalized touch. Display small, simple items that add a personal touch without creating a feel of clutter. Too many displays will cause the kitchen to look much smaller, but the right amount can add to the warmth and provide an illusion of a larger space. Whether you’re a homeowner or looking to become one, chances are you know how overwhelming choosing designs to suit your taste and lifestyle can be. Well, you’re not alone. If you’re confused and not sure what your style is, read on to learn before remodeling your kitchen or bath. It will make the process much easier for you and for your designer! Victorian – Characterized by steeply pitched roofs, pointed arch windows, elaborate trim along roof edges, high dormers, lancet windows, and other Gothic details. Light fixtures range from chandeliers and kerosene and electric lamps to astrals and sconces. Cabinets are usually weathered looking and made of heavy, real wood with chrome pulls and knobs. Modern – Moderns styles change from year to year. Most recent designs include sleek, straight and clean lines. Less is more, such as less accessories, hidden appliances, and minimal details. Common materials include stainless steel, marble, granite, and frosted glass. Basic geometric shapes and bold, bright colors such as reds, blues, and yellow or black and white are prevalent. Southwestern – This style features a lot of detail and craftsmanship. Natural materials such as stucco and hand-painted fabrics are very common, as are wood, quarry tile, ceramic tile, earth tones, and vibrant accessories. Colors usually reflect the nature of the desert such as warm oranges, greens, tans and browns. 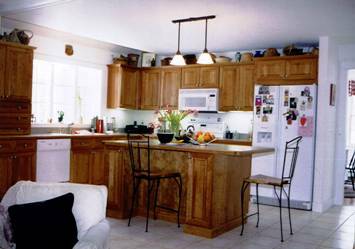 Southwest kitchens usually incorporate ceramic materials and terra cotta elements. Traditional – Plays up architectural details such as crown moldings, raised wood paneling and rich, deep colors to enhance the mood and traditional feel. Dark stains, honey tones, semi-opaque paints, wicker baskets, and oak cabinets add to the usually more formal feel than country style. Country – Rustic, weathered look creates a warm, cozy feeling in a country style home. Common colors range from muted hues to earth tones. Exposed beams, pine paneling, brick and barn boards are elements used to express this style. Fabrics and patterns are a sure way to create a country feeling, as is the use of wallpaper and baskets. Eclectic – A mix of old and new features combined for a harmonious look. This style is not characterized by a particular color palette, patterns, style, or material but is a mix of extravagant decorations from numerous eras, including hand-me-downs, second-hand items and other recyclables. Kitchens and bathrooms may include modern appliances mixed with antique decorations to the complete opposite. Visit the Homeowners' Toolbox. You'll find an assortment of Home and Garden, Home Office, and Building Construction goods and services to suit all styles and tastes. There are Daily Specials, Coupons and Money-Saving Offers from recognized online merchants such as Mikasa, The Sharper Image, CambridgeSoundworks, inhabit, Knobs and Things, The Artful Home, Domestications, Smith and Hawkin, Wayside Gardens and many more. You just might find what you're looking for in the "toolbox"! 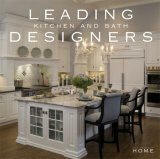 Visit the Brizo website for luxury in kitchen and bath fixtures.